^ Russell D. Gray and Quentin D. Atkinson, Nature 2003, 426(6965):435-9. ^ J.P. Mallory, In Search of the Indo-Europeans, Thames and Hudson Ltd., London (1989). ^ G. Steiner, The immigration of the first Indo-Europeans into Anatolia reconsidered, Journal of Indo-European Studies 18 (1990), 185–214. Luraghi, Silvia (2015) . 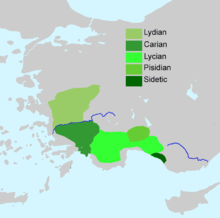 “The Anatolian Languages”. In Ramat, Anna Giacalone; Ramat, Paolo. The Indo-European Languages. Routledge. pp. 169-196. ISBN 113492187X.